Diffraction is the bending of waves (such as light waves or sound waves) as they pass around an obstacle or through an opening. Anyone who has watched ocean waves entering a bay or harbor has probably witnessed diffraction. As the waves strike the first point of land, they change direction. Instead of moving into the bay or harbor parallel to (in the same direction as) land, they travel at an angle to it. The narrower the opening, the more dramatic the effect. As waves enter a narrow harbor opening, such as San Francisco's Golden Gate, they change from a parallel set of wave fronts to a fan-shaped pattern. The diffraction of light has many important applications. For example, a device known as the diffraction grating is used to break white light apart into its colored components. Patterns produced by diffraction gratings provide information about the kind of light that falls on them. impression that light traveling in a straight line from the Sun was blocked by the pole. But careful observation of the shadow's edge will reveal that the change from dark to light is not abrupt. Instead, there is a gray area along the edge that was created by light that was bent—or diffracted—at the side of the pole. When a source of waves, such as a lightbulb, sends a beam through an opening, or aperture, a diffraction pattern will appear on a screen placed behind the aperture. The diffraction pattern will look something like the aperture (perhaps a slit, a circle, or a square) but it will be surrounded by some diffracted waves that give it a fuzzy appearance. The diffraction that occurs depends primarily on two variables: the wavelength of the wave and the size of the opening or aperture through which the waves pass. (Wavelength is defined as the distance between two identical parts of a wave, such as two consecutive crests of a wave. The only difference between waves of light, waves of radar, waves of X rays, and of many other kinds of waves is their wavelength—and their frequency, which depends on their wavelength.) The wavelength of light, for example, is in the range of 400 to 700 nanometers (billionths of a meter). In comparison, the wavelength of radar waves ranges from about 0.1 to 1 meter. Diffraction pattern: The wave pattern observed after a wave has passed through a diffracting aperture (or opening). Interference pattern: Alternating bands of light and dark that result from the mixing of two waves. Wavelength: The distance between two identical parts of a wave, such as two consecutive crests of the wave. 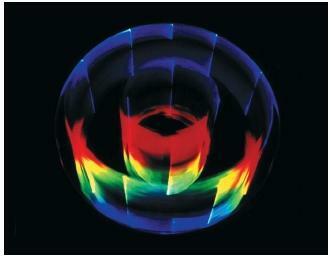 X-ray diffraction: A method used for studying the structure of crystals. When the wavelength of a wave is much smaller than the aperture through which it travels, the observed diffraction is small. A beam of light traveling through a window, for example, has a wavelength many trillions of times smaller than the window opening. It would be difficult to observe diffraction in this situation. But a beam of light passing through a tiny pin hole produces a different effect. In this case, a diffraction pattern can be seen quite clearly. Diffraction gratings. A diffraction grating is a tool whose operation is based on the diffraction of light. It consists of a flat plate (usually made of glass or plastic) into which are etched thousands of thin slits or grooves. The accuracy of the grating depends on the grooves' being parallel to each other, equally spaced, and equal in width. When light strikes a diffraction grating, it is diffracted by each of the thousands of grooves individually. The diffracted waves that are produced then mix or interfere with each other in different ways, depending on the source of the light beam. Light from a sodium vapor lamp, from a mercury (fluorescent) lamp, and from an incandescent lamp all produce different light patterns in a diffraction grating. Scientists have recorded the kind of light pattern (spectrum) produced when each of the different chemical elements is heated and its light shined on a diffraction grating. In studying the light of an unknown object (such as a star), then, the diffraction grating spectrum can be compared to the known spectra of elements. In this way, elements in the unknown object can be identified. X-ray diffraction. In the 1910s, William Henry (1862–1942) and William Lawrence Bragg (1890–1971), a father-and-son team of English physicists, had an interesting idea for using diffraction. They set out to find the very finest diffraction grating anyone could imagine and decided that a crystal—such as a crystal of ordinary table salt—fit the bill. The atoms and ions that make up a crystal are arranged in the same way as the grooves of a diffraction grating. Crystalline atoms and ions are laid out in very orderly rows at exactly the same distance from each other, as is the case with a diffraction grating. But the size of the "grooves" in a crystal (the space between atoms and ions) is much smaller than in any human-made diffraction grating. The Braggs set to work experimenting with crystals and diffraction. Unfortunately, the wavelength of a light wave was too large to be diffracted by atoms and ions in a crystal. But X rays—which have a much smaller wavelength than light waves—would diffract perfectly off rows of atoms or ions in a crystal. When the Braggs shined X rays off various crystals, they made a fascinating discovery. For each type of crystal studied, a unique pattern of fuzzy circles was produced. X rays had been diffracted according to the ways in which atoms or ions were arranged in the crystal. The Braggs had discovered a method for determining how atoms or ions are arranged in a given crystal. That method, known as X-ray crystallography, is now one of the most powerful tools available to chemists for analyzing the structure of substances. urs presentation is very very good and also it is very simple to understand . but sir i have a confussion. pls solve this. we know sodium light is monochromatic light but in diffraction grating its produces spectrum. why sir?